As Steven Naismith led Scotland’s attack in Israel last night with Leigh Griffiths at home, Tony Watt would have been an interested observer. The St Johnstone striker still has ambitions to fulfil at international level and is keen to seize any opportunity to return to the national team. He has six goals in 13 appearances since moving to Perth in July and wants to add to his solitary Scotland cap earned in a friendly against Czech Republic in March 2016. Johnny Russell and Oli McBurnie are useful back-ups to Naismith, but it remains to be seen if Griffiths’ withdrawal from the squad on Monday costs him his place for next month’s games against Albania and Israel. The former Celtic forward is enjoying a sustained run of games in the traditional No.9 role, which he feels is his best position. 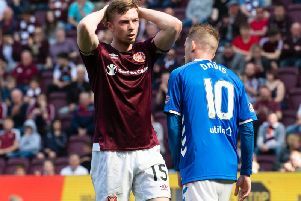 Had he been given that position by Hearts, his season-long loan agreement may not have been cut short in January 2017. He left after one goal in 17 games. “I would liked to have played more for Hearts,” he said. “When I went back to Charlton in the January, I wasn’t fully fit. I’d hardly played and it probably set me back a couple of months. I don’t look back with any regrets. Hearts is a good club and I had a good time there. We had a few good positive results as well. “I was more sitting deep, coming from midfield towards the striker. As much as I did it and as much as I enjoyed it, for my own career it would probably have been better if I played up front and gabbed more goals, forgot about the performances and thought more about the goals. That’s what I’m trying to do this year. Joining St Johnstone on a one-year deal with the option to extend was the correct decision, according to Watt. He spent the second part of last season inactive having played for Charlton and the Belgian side OH Leuven. FIFA rules prevent anyone taking the field for three different clubs in one season, so Watt trained with Aberdeen for four months before signing for the Saints manager Tommy Wright. “I wanted to get back playing under a manager who trusts me,” he said. “Tommy is brilliant and he’s been really good with me. He won’t sit me down and try to over-complicate my game. He will tell me what he wants from me, and if I don’t do it he’ll tell me again. Then, if I don’t do it a third time, I probably won’t play. I haven’t experienced that yet but I know how hard he can be. “He wants me to play up front and that’s brilliant because that’s exactly where I want to play. That’s what I’ve always wanted. He doesn’t want me messing about and coming too deep. I’ve not really had a sustained run at it in the league because I’ve had a wee niggling injury, so I’ve been in and out for the last few weeks. If he continues scoring, Watt may become an asset St Johnstone cash in on. He certainly has the talent to play on a higher platform but his career is undergoing a vital rejuvenation thanks to those at McDiarmid Park. “I’m here until the summer and then I’ll see what the club say. The manager is still in talks about his future and he was a big reason why I came here,” explained Watt. “I’m just happy playing. St Johnstone have shown a lot of faith in me so I need to be respectful and repay that by doing well. “We don’t get anything handed to us here, we need to work for everything. That’s a good mentality to have and I’m happy to have that mindset along with the rest of the boys. We all know nothing is given to us. We need to earn whatever we get. That’s good for your focus and concentration. “The fans have been positive. We’ve had a few hard games and they’re still backing us. Now we have to focus on the next few games coming up. I still believe we have had a good start to the season. We got punished on Sunday losing 6-0 against Celtic and the boys know that. We know what we can do and we’ll pick it up again.